Long-time BIRN staffer honoured for her contribution to democratization and better understanding in Southeast Europe. The South East Europe Media Organisation, SEEMO, an affiliate of the International Press Institute, IPI, has named Jeta Xharra as winner of the 2012 Dr Erhard Busek – SEEMO Award for Better Understanding in South East Europe. A 10-member international jury chose Xharra for the award based on her outstanding contribution to the process of democratization and better understanding in South East Europe. 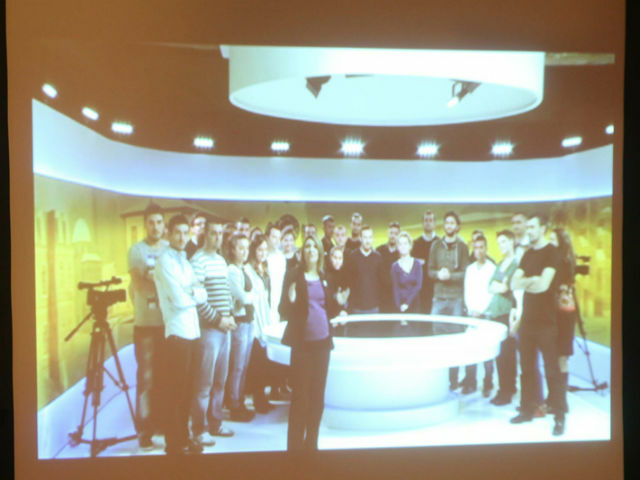 “This is recognition of BIRN’s contribution to raising journalistic standards in our region. I feel exceptionally privileged that it has been recognized that debates and investigative reporting that the BIRN team and myself have produced over the years have contributed to more rule of law, more accountability and more freedom of speech in our region and particularly in my young country,” Xharra said. The award, which carries a cash prize of €3,000, will be presented on November 16 in Vienna by Dr Erhard Busek, president of the Institute for the Danube Region and Central Europe, and by Oliver Vujovic, SEEMO’s secretary general. Since 2005, Xharra has been Kosovo director of the Balkan Investigative Reporting Network, BIRN, as well as a presenter and the editor-in-chief of Life in Kosovo, a TV programme that combines investigative journalism and discussions. Kosovo’s most-watched television current affairs show is shown weekly on Radio Television Kosovo, RTK, and is credited with pushing the boundaries of debate, holding the authorities to account and opening up discussion on taboo subjects. BIRN Kosovo has 70 staff members and contributors, producing English-language publications, such as Balkan Insight and Prishtina Insight, as well as broadcasting radio and TV programmes and printing publications in local languages, including the newsletter Justice in Kosovo and reports from BIRN’s Courts Monitoring Project. Xharra started her journalistic career as a local producer for BBC News and Channel 4 in 1998, and rose to become manager of the BBC’s Kosovo Bureau. In 1999, she worked for BBC News in Albania and Macedonia. In 2003 she opened the Kosovo office of the London-based Institute for War and Peace Reporting, IWPR. Xharra has lived most of her life in Pristina, where she attended school and university. She studied drama at the Academy of Arts in Kosovo. She also lived in London, where she obtained a Master’s in War Studies at King’s College in 2000 and a Master’s with distinction in Screenwriting from the London College of Printing in 2002. In London, she wrote the play Warless, which was presented as a reading at London’s Royal Court Theatre during the Young Writer’s Festival in 2004. She has contributed to various different publications in the United Kingdom, including theIndependent, the Economist, the Sunday Telegraph and Jane’s Intelligence Review. In Britain, Xharra worked for the Foreign News Planning Desk at the BBC World Service and for IWPR. The Dr Erhard Busek – SEEMO Award honours journalists, editors, media executives, media experts, writers and journalism trainers in South East Europe who have contributed to promoting better understanding in the region and who have worked towards solving minority-related problems, ethnic divisions, racism, xenophobia, gender discrimination and homophobia among other issues. Busek, a former Vice-Chancellor of Austria, is Jean Monet Professor ad personam, president of the Institute for the Danube Region and Central Europe, coordinator of the Southeast European Cooperative Initiative, SECI, and former special coordinator of the Stability Pact for South Eastern Europe.